A selection of premium polishing cloths for coarse and fine polishing of hard, soft and composite materials. Most cloths are available with plain or PSA backing for easy mounting on the polishing discs. The plain polishing cloths need to be clamped on the polishing discs with a clamping ring. To facilitate this the plain discs are aproximately 2" larger than the polishing discs so the cloth folds over the edge of the disc for clamping. 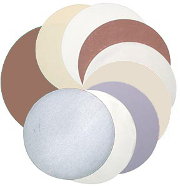 8" plain polishing cloths are 10" diameter and 10" plain polishing cloths are 12" diameter. The polishing cloths can be used with diamond compound, diamond spray or alumina suspension. 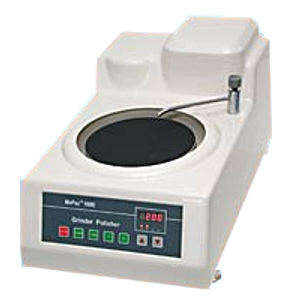 Professional single 8" disc grinder / polisher with digital speed control. Ideally suited for small and medium sized labs in industry, research and universities. Designed for professional grinding and polishing of metallographic, ceramographic and gelogical samples and cross sections. The XP 810E has a quick exchange disc system, using 8" discs, to facilitate all grinding and polishing steps from coarse grinding up to final polishing. This workhorse has a sturdy and solid construction delivering reliable performance for many years of service. It includes a water supply and drain for grinding operations. The skin is made from a single piece of rust-free and strong glass fiber filled polyester. Equipped with a strong 1/3HP rated motor. For optimum results on a large variety of samples the XP 810E is equipped with two fixed speeds of 150 and 300 rpm and digital variable speed control from 50 to 600 rpm. The speeds are easily changed and the digital speed control enables consistent results. The XP 810E is a sophisticated grinder / polisher with an excellent price / performance ratio.